I posted my bike and noticed right off the bat there were at least two obvious scams, 2016 can am spyder $6000,new Vespa 300 sport $1000. :angry:Has craigslist turned into a sewer since my last sale by me two years ago? Has craigslist turned into a sewer since my last sale by me two years ago? No, they've always been like that. I buy/sell a couple every year and there are a lot of scammers out there. For me, I simply have them show up here, with cash. If I'm buying - I make sure to get more pics and talk to them on the phone. If you smell a rat - your instinct is probably correct. Like any classifieds Craigslist isn't immune to scam artists. I read they were forced to take down the Personals section because it was getting loaded with prostitutes and predators I wouldn't say it's become a sewer but pretty much anything online these days has its share of scum. Generally if the price is too good to be true it probably is. 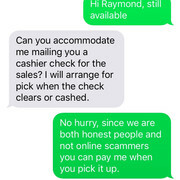 When selling there's usually an initial wave of low-ballers or scammers before the real buyers show up. I've has mostly good dealings using the site. Just have to keep your guard up. Craigslist is worth what you pay for it. Honestly I like CL as it is free and reaches a lots and lots of people. The scams are blatantly obvious so just delete them as they come in and go about you day. I've bought and sold quite a bit on CL, and for the most part it has been a positive experience both ways. Sure there are turds out there, but for the most part it's been a good experience.